the trend follower: Paul Tudor Jones - Is there a contradiction here? Paul Tudor Jones - Is there a contradiction here? The above excerpt comes from PTJ's interview with Tony Robbins, which appeared in the book Money: Master The Game. I've not read the book, but I've seen this paragraph quoted enough on social media. Further on in the interview with Robbins, he talks about that 1987 market crash: "It had done under the 200-day moving target. At the very top of the crash, I was flat." This seemingly is at odds with what he discussed in his Market Wizards interview, and also the famous video which followed his Tudor Futures Fund in late 1986/early 1987, and which every so often re-appears on YouTube. Based on that video, he was actually following Peter Borish's analogue model of the market from 1929, and later made a ton of money shorting the indices when they crashed in the October. "I have always been a swing trader, meaning that I believe the very best money is to be made at market turns. Everyone says you get killed trying to pick tops and bottoms and you make all the money by catching the trends in the middle. Well, for twelve years, I have often been missing the meat in the middle, but I have caught a lot of bottoms and tops." 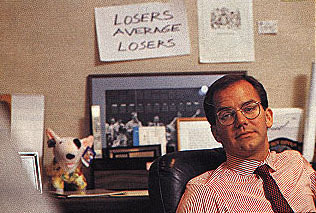 "(That is the same reason) I attribute a lot of my own success to the Elliot Wave approach." Is there a contradiction here? Maybe. Maybe not. Read that first paragraph again. He is referring to investing, not trading. But this quote has been seized upon and re-quoted by an army of traders. The point I am making here is that, it is very difficult (if not impossible) to take an opinion or belief relating to trading/investing mechanics like those shown above, and make it a universal principle that is suitable for all market participants. Also it is difficult to interpret those quotes without knowing what context they are being used. And of course, people evolve as traders over time. What he believed in during the 1980's may be completely different to 2015. In short, each trader must arrive at his own conclusions as to what his own beliefs are about the markets, and also how he can take those beliefs and formulate his own trading rules. As for my own beliefs on this, I think that yes, for investors, or long-term traders, then factoring in the 200 day moving average or some other long-term 'filter' is basic common sense. Investors are looking to hold positions for several months or even years, therefore tracking such an indicator puts you on the right side of those major trends, and should form part of your trading rules. But for other traders? I'm not so sure. If you are a day trader, or a short-term swing trader, does it matter whether the market you are trading is above or below the 200 day? Probably not. Marty 'Pit Bull' Schwartz talks about using the 10 day exponential moving average as his own trend filter. To me, that makes sense - he is trading shorter-term, therefore he needs a shorter-term trend filter. When reading the original rules used by Richard Dennis and the Turtle traders, it is clear that no moving averages or trend filters were used. They simply took entry signals when price broke out to new 20 day or 55 day highs, depending on which system they were using. All in all, while PTJ's advice is excellent for those trading or investing for the longer-term, it isn't potentially as useful for those looking to trade shorter-term timeframes or expected holding periods. One other important point. What you also should factor into your own thinking and trading plan is whether you use such a filter when determining your level of market exposure and/or bias. PTJ's comments indicate he was tracking the 200 day moving average on the indices. Yet I know plenty of successful traders who pay no attention to what is happening with the major market averages - they focus solely on what price is doing in the individual stocks they are looking to trade. This is something I talked about extensively on a few posts towards the end of last year. What if the stock you are looking to trade is above its 200 day moving average, yet the index is below its own moving average? As always, the answers to the above questions will depend on what your own beliefs are, and can help you in formulating your personal trading plan and rules.